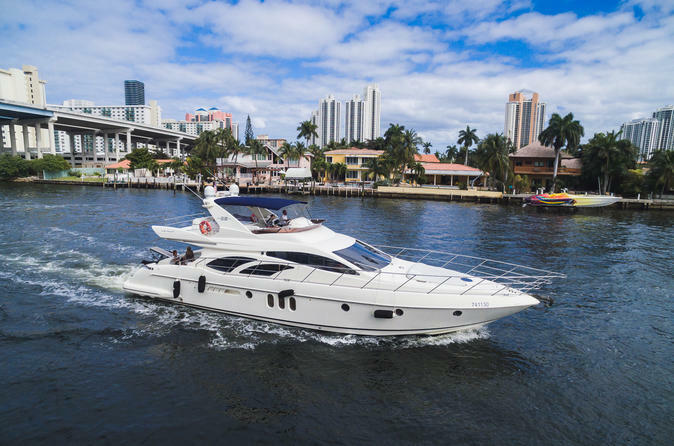 Time to take a day off, and relax on this beautiful 62’ Azimut Flybridge. Choose between a 4 hour package or 8 hour package, which can be tailored specifically to your needs. Rejuvenate your mind and body with a peaceful charter or party until the sun goes down. Both packages come with Captain, stewardess, jet ski, boat fuel for local cruising at idle speed, towels, water, sodas, and ice. Spend a day on the beautiful Biscayne Bay, where the knowledgeable captains will guide you through the many islands while providing commentary on the scenery. Our experienced stewardess is also on board to cater to your every need so you never have to lift a finger. When you are finished learning about the area, drop your anchor and swim or jet ski. All of the yachts are stocked with popular watersports equipment, and more can be provided depending on your needs. For total relaxation, be sure to contact the supplier beforehand.